Convenient disposable tear-off wipers, ideal for both hygiene and the budget! The healthcare industry loves our products. One of the best sellers is our CLASSIC WIPES ON A ROLL. That’s because this product is soft, absorbent, strong, disposable, and AFFORDABLE! That’s right, for just a little more than you would spend on regular paper towels, you can have our CLASSIC MULTIPURPOSE WIPES ON A ROLL. These general purpose wipers will hold together while you scrub out a sink or stay soft enough to clean pudgy little hands at the snack table. Daycare centers, aged care facilities, and more turn to our Classic Wipes for their dirty work. 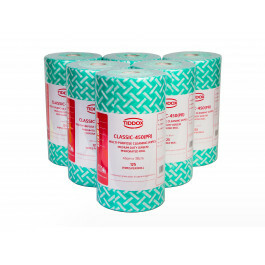 Designed with cost conscious budgets in mind, this product is stacked with nearly 50% more wipes than typical rolls, combined with high levels of the absorbing viscose material, offered at a very competitive and affordable price, which makes it a favourite in the healthcare sector. There are 125 wipes on each roll, perforated to make it easier to tear them off. You can use the cloth just as you would a paper towel or, if you want, as a washcloth. These healthcare wipes are that good. They are designed for medium-duty use, which makes them a great choice for all kinds of cleanups. They also have a high viscosity rating, making them better than paper towels at soaking up liquids and semi-liquids. That’s right, puke, diarrhoea, and snot all bow in defeat to this general purpose cloth! And, maybe the best part is – you can throw it away when you are done! That’s right! You don’t have to wash out all of that yuck, because this product is affordable enough to throw away. One carton has 6 rolls of these CLASSIC WIPES. Try one out with your next janitorial order, and you’ll love them! We also have a colour coded viscose cloths, which are super absorbent sponges called MAXI WIPES, as well as the soft, highly absorbent OMNIWIPES, which are very popular in aged care residences and in dental practices. Another very affordable tear-off wiper, which can be pulled out from a wall dispenser, is the low linting WHITE RHINO ROLL.